Weather Outside Is Frightful; Tornadoes, Snow, Rain Lash Much Of Nation : The Two-Way Twisters touched down across the Southeast. Heavy snow and rains toppled trees and power lines. At least six deaths are being attributed to the massive system's effects. 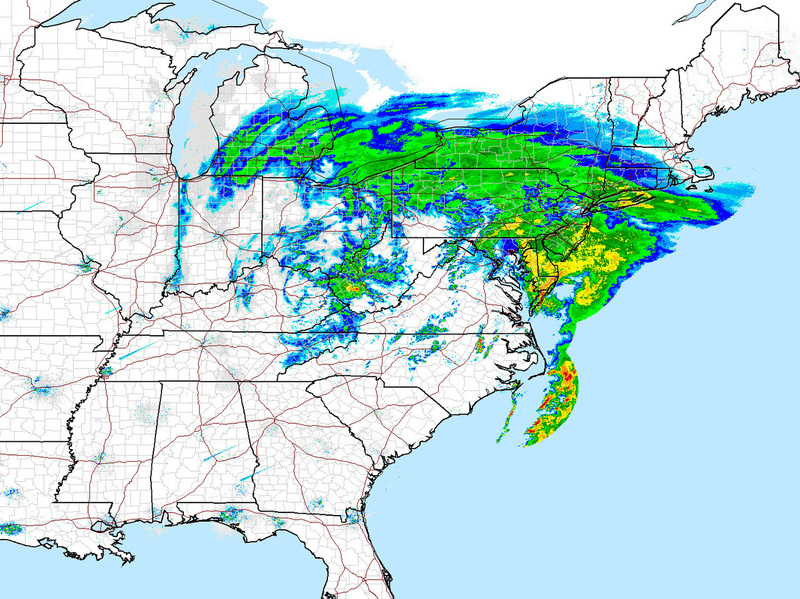 Now, it's hitting the Northeast. Hundreds of flights have been canceled. Drivers are being warned to stay off many roads. A large and powerful winter storm brought snow and ice to large sections of the Midwest and East Coast Wednesday. The weather made roads treacherous in many areas. But in Pittsburgh, Pa., Chandler Fescemeyer, 17, found a reason to break out a snowboard. At least six deaths, substantial damage and an increasing number of travel delays are being blamed on a storm system that has brought snow to the Midwest and tornadoes to the Deep South and is now pummeling parts of the Mid-Atlantic and Northeast. Forecasters warned on Christmas Eve that things could get rough, and they were right. "I've heard it from those who've been through it plenty of times — 'It sounds like the roar of a train.' Finally, I got my confirmation. Yes, indeed it does." The wicked weather covers a lot of territory. (Image shows conditions as of late afternoon Wednesday, ET. "Sirens had started to sound. I turned on TV, but the signal was disrupted. That's when the wind began to pick up. Then it roared. I moved myself into my bathroom as I heard a clanging noise, like someone taking a large metal spoon to a stock pot. The power then flickered. Once it went off. Then, back on. Off for good. I did what one was supposed to do, I hunkered into my bath tub with my hands above me head curled into a fetal position. "That's when I heard the roar and prayed that my building would not collapse on top of me. "It didn't. But I knew what I had just heard. It was a tornado." According to the newspaper, more than one tornado may have hit the area. The Associated Press says "rare winter twisters" damaged numerous homes in Louisiana as well. And the wire service adds that "Mobile was the biggest city hit by numerous by the rare winter twisters. Along with brutal, straight-line winds, the storms knocked down countless trees, blew the roofs off homes and left many Christmas celebrations in the dark. Torrential rains drenched the region and several places saw flash flooding." All told, there were "34 possible tornadoes" reported across the region, ABC News says. The first three storm-related deaths reported were: near Houston, where a falling tree killed the driver of a pickup truck; in Rayville, La., where a man died after a tree fell on his house; and in Fairview, Okla., where a woman died in a traffic accident on a snowy highway. Late this morning, The Associated Press said the death toll had risen to at least six. The wire service reported that "two passengers in a car on a sleet-slickened Arkansas highway died Wednesday when the vehicle crossed the center line and struck an SUV head-on. In Oklahoma, the Highway Patrol said a 76-year-old Wisconsin woman died Tuesday. She was a passenger in a car that was hit head-on when a pickup truck crossed into oncoming traffic on Interstate 44." As for the more "normal" winter weather, The Weather Channel says that the storm system working its way across the nation "will have deposited snow from California's Sierra to New England" by the time it moves off the East Coast on Friday. It's going to "track toward the Tennessee Valley and central Appalachians and Mid-Atlantic states and New England through Wednesday and Thursday. This will produce a stripe of snow from the Ozarks northeastward into the Midwest. Peak snowfall amounts in the 6-12 inch range are expected from parts of Arkansas northeast into Ohio." Hundreds of flights were canceled Tuesday. And as of this evening, 1,400 more flights had been canceled, the AP reports. Travelers in the nation's midsection — and now the Northeast — are also being warned to either stay off the roads or plan to be off them in coming days. By early afternoon, police had reported "scores of accidents on snow-covered highways in central and western Maryland" as the storm headed north, AP adds. Arkansas' largest utility said that "some of the nearly 200,000 people who lost power could be without it for as long as a week because of snapped poles and wires after ice and 10 inches of snow coated power lines," the AP reports. Update at 5:45 p.m. ET. New Storm Center. "A new low pressure center currently forming in North Carolina will become the dominant center as it tracks along the mid-Atlantic coast and intensifies tonight," says the National Weather Service, "reaching the New England coast on Thursday." The weather agency says that people who live in the area from the lower Great Lakes to northern New England can expect to see 12 to 18 inches of snowfall. Update at 1:25 p.m. ET. Blizzard Conditions Move North. "A storm system that is blamed for at least six deaths is spreading blizzard conditions as it moves toward the northeastern United States, slowing holiday travel. Snow blew across southern Illinois and southern Indiana early today as the storm tracked up the Ohio River valley toward the Eastern seaboard and New England." The wire service adds that another 900 flights had been canceled by midday today, and that "a line of blizzard and winter storm warnings extends to New York and on to Maine." The Associated Press says there are now at least six storm-related deaths. Along with the three reported earlier in Texas, Louisiana and Oklahoma, the wire service says "two passengers in a car on a sleet-slickened Arkansas highway died Wednesday when the vehicle crossed the center line and struck an SUV head-on. In Oklahoma, the Highway Patrol said a 76-year-old Wisconsin woman died Tuesday. She was a passenger in a car that was hit head-on when a pickup truck crossed into oncoming traffic on Interstate 44." -- From Little Rock, Ark., KATV reports "it was the snowiest Christmas in Little Rock and the second snowiest December day in the city's weather history. Many areas are waking up to no power and up to 13 inches of snow." -- In Carbondale, Ill., WSIU reports that nearly a foot of snow has been dumped on the area, and that "National Weather Service Lead Forecaster Dan Spaeth says this is the first time the agency has issued a blizzard warning for this region." 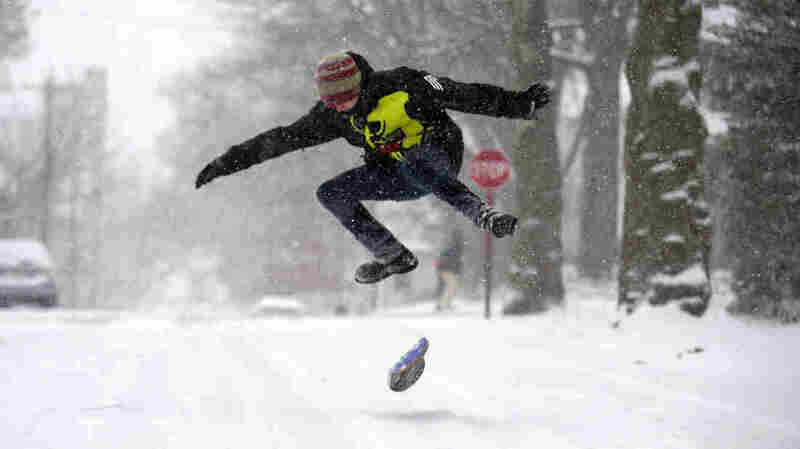 -- The Indianapolis Star says roads in the area are treacherous. Indiana route 37 is "at a standstill with about 40 cars stuck in the snow. Indiana Department of Transportation is en route but cleanup may take up to two hours." -- Winter weather warnings are up across much of West Virginia, The Charleston Gazette says. -- There's good news in Alabama. "Following the storms that passed through the area on Christmas Day spawning a tornado that hit the Midtown area, the weather today should be mostly sunny," AL.com reports. -- Washington, D.C., will get a "wintry mix to heavy rain today," and can expect snow later in the week, according to the Capital Weather Gang. -- Philadelphia can expect "a small amount of snow, followed by heavy rain" today, Philly.com says. -- The region around Buffalo, N.Y., may get "up to 16 inches of snowfall during the next couple of days," reports the Buffalo News. The National Weather Service's constantly changing "Doppler Radar National Mosaic" image shows how large the storm is — with a tail stretching across Florida and severe weather curling up the East Coast and across parts of the Great Lakes region.